The story is about Ted Kennedy’s Chappaquiddick scandal, where he drunkenly crashed his car into a lake, resulting in the death of a local girl he had been out with, played by Kate Mara. The ensuing scenes involve powerful family friends helping Ted cover it up, and attempt to avoid prosecution as he tries to kick start his own political journey. The performances are all fine, especially Clarke and the cameo appearance by Bruce Dern as the Kennedy patriarch, but it often feels like a by the numbers accounting of the events. It doesn’t want to tarnish the Kennedy legacy and play hard ball, but it also doesn’t want to portray a complex character by relying on emotion and tension in the story. Instead, it’s the kind of biopic that fades into the background as better, more dramatic movies fill in the film landscape around it. Gabrielle Union needs to defend her family from a group of burglars who want a massive amount of cash from her family’s old home. Somehow, there’s a ton of money in a safe, even though no one should ever keep large amounts of cash stagnant, it completely rips the cash of its liquidity. 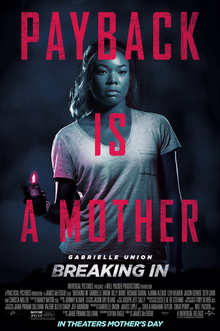 Either way, it’s the kind of movie where Billy Burke gets to ham it up as an evil villain without much character development, and Gabrielle Union gets to be the resourceful mom who fends off the threat. It’s a specific kind of fantasy, one where we think about how well we’d react and the character fills in the gap for us. There’s no tension, it’s not fun-bad or unintentionally funny. It’s just the worst kind of film, where it’s completely insipid and uninspired. International intrigue movies have been few and far between lately, with drama tending to split between historical fiction/biopics or something a little more socially relevant. The pairing of Jon Hamm and Rosamund Pike interested me, however, and I decided to rent this movie on a whim a few weeks ago. It takes place during the Lebanese Civil War, which had implications within the Cold War as a Christian-centered government opposed by leftist Muslim forces. It concerns Jon Hamm as a storied mediator, who is brought out of retirement by the U.S. government in order to rescue a former colleague and friend involved in a hostage situation. The acting is all solid, especially Hamm as the central role, clearly a character with some emotional baggage resulting in alcohol addiction that plagues his attitude and thinking throughout the entire scenario. Pike is the governmental agent assigned to protect Hamm, and she acts often like a motherly figure trying to force what’s best for Hamm into his hands. 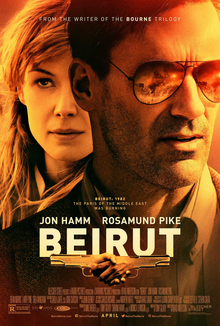 The movie does a poor job of explaining the stakes and the geo-political landscape of Lebanon during that time, and it took some research on my part to understand what the conflict was really about. It seems almost irresponsible for the movie to have this self-contained bubble with decent performances but no broader point about what happened in the struggle or why it matters. There’s nothing special or particularly noteworthy about this movie, but it’s fine if you like drama that dabbles in intelligencia. Both this movie and the following film The Rider were early-year festival darlings which may not have the type of gravitas to contend for awards but will probably hang around critic’s year-end lists in 2018. The first is Lean on Pete, a low-key dramatic adventure film from the Venice Film Festival starring Charlie Plummer after his successful turn in Ridley Scott’s All the Money in the World last year. Plummer plays Charley, a local impoverished kid who finds a job assisting a sporting horse owner played by Steve Buscemi. His father (Travis Fimmel) is somewhat absentee, and he begins taking long trips around with Buscemi and his best race horse, named Lean on Pete. When some negative things happen, Charley and Lean on Pete start a cross country trip in search of Charley’s aunt. Chloe Sevigny and Steve Zahn also make brief appearances along the way. This is a roadtrip movie that mostly lacks the feel-good adventure element, and focuses instead on the harsh life that Charley lives on a day to day basis. His heartbreak and abandonment is reflected in every scene, and his care for the horse is almost like his clinging to life as he homelessly wanders around rural America. A film which does not have a single experienced actor actually resulted in one of the best lead performances of the year so far in Brady Jandreau. We get a neo-Western where a young man who has made a career out of doing what he loves, bull riding. One serious head injury later, and he’s not only coping with the physical consequences, but also trying to reevaluate what to do with his life in a rural town that isn’t exactly rife with opportunities. We haven’t gotten a ton of movies about celebrities and the way they interact with their personal assistants, but Aaron Katz’s Gemini gets the best out of Zoe Kravitz and Lola Kirke in a noir genre piece involving a potential murder and shady histories among characters. Kirke is the unassuming assistant tasked with following around her friend and employer Kravitz, who is having some sort of career crisis after dropping out of some major projects. There’s hints of domestic abuse, there’s hints of weaponry and sexual secrets, but for all of the time Kirke spends trying to seem inexperienced with such affairs, the movie begins casting doubt on all of that. After a major event happens to Kravitz’s character, we spend the remainder of the film picking up the pieces along with Detective John Cho (who gives another good performance this year). The movie looks, sounds, and feels fantastic. It builds a great ambiance, and is shot through this purple fog that really gives a new look to urban life. Then, there’s occasional twists with surges of violence which really work within the confines of the tone and atmosphere previously built. Not every character motivation makes sense, and the film does eventually start losing steam, especially when more and more characters are introduced. However, this is totally worth a viewing for the style alone.